This thread is for any discussion or questions related to the mission An Enigmatic Treasure with a Recondite Discovery by GORT. Last edited by Beltzer; 1st Dec 2018 at 16:33. Started with this one. I've got to the warehouse and used the mold to get the mage's bracelet. However, I am now left with no clue where to go next. Can anyone point me in the right direction? @nicked: back to the place where you got the poker. On Expert. I can't even find the Mages' Guild novice or his poker. I've been inside the opera house, only 2 people in there look like mages, one dressed in red and one in pale blue, but neither has a poker. Last edited by Marbrien; 1st Dec 2018 at 12:54. I have the poker and the readable with the mage's poem. Where do I melt the poker into its correct form and where do I use the poker, once so melted? I've explored the opera house, including the area behind the stage, and found nothing to use the poker on. Update: Figured it out. Search the warehouse complex, far away from the opera house, for a place to melt the poker. Last edited by prjames; 1st Dec 2018 at 18:59. @prjames Exit the opera house and you should witness a cutscene. A new way is open for you. You should find where to melt the poker there. Once you made it, go back to where you found it. Amazing levels of detail in the architecture in this mission! I am at the guild. Found and used the room of statues key and got the hand and used it. I also found the hall of idols key, but have no clue where to use it. I play this mission now. So far I just beat city part at the very beginning and opened door to opera. The city has proper length, but unfortunately exploration isn't rewarding. Most of optional paths ends with no reward at the end. Which is disappointing. Finding the path to the opera was confusing. I explored the city to find at the end well lighted square. I saw that there is something behind wall. So I pushed barrel to it. It took me 10 min. And at the end the wall wasn't even climbable. This really confused me. But it is partially my fault that I didn't notice a scroll that I started with. I hope that opera is better designed. Weird thing: why I start the mission on Expert with slightly more money to shop than on Hard? Another thing: I have objective to not get discovered more than 5 times when in Mage Guild. Does that mean I need to ghost this area with less than 5 KO? Or does that mean I can KO all of them but just not get spotted? Anyone knows? And a question about getting to the opera. Does servant really KO-ed guards by farting? Hall of Idols key Check upstairs balcony overlooking the lobby, there's a line of statues protecting something. The objective to not get discovered more than 5 times when in Mage Guild has a purpose for later on in the mission, yes you can KO them, it's being seen by a Mage that counts towards the 5. And no, no farting, but a gas mine. Is this the door with the 3 guards before? I can not believe that's the only entrance or am I wrong? I've knocked out the Rogue Mage in the 'converted' opera house and put him in the guard's bunk room in the same building, but that objective won't tick off. I can't see that anything has fallen off him. What am I missing please? How do I get out of the room of statues after taking the Hand of Glory? What kind of item do I need to put in the pedestal? PS: Okay, nevermind. I knocked out a guard and put his body on one of the teleporters. Last edited by Aemanyl; 2nd Dec 2018 at 10:10. Thanks I cant figure out why i missed that. I was sure that i had seen one more of those locks. Now i ask the same question as Marbien. It's not a rogue Mage but a guard in disguise you need to find, you also need to drop him on a specific bed in the barracks. There's an object in one of the training rooms that you are meant to use. Fortuni, the best proof that Thief teaches you problem-solving . - on one occasion, I reloaded a quick save from the Guild and the screen went black, I had to load it again and the problem was solved. Thanks for the mission, GORT & team. I really enjoyed playing it and I appreciate your enormous effort. I might write a short review later on. #1 Thought we had dealt with that, he used to occasionally fall down the elevator hole,, but GORT changed his AI path and it never happened to me again. #2 I got stuck once but wriggled out with a struggle, so not sure if I reported it, I usually only do so if you need to reload. #3 That servant was a pain in the backside, a complex scripting issue that we thought was sorted, maybe he did drop the gas mine but not close enough to the guards. #4 Yeah, GORT took Dromed to it's absolute limit with this mission, so much lighting he was only 1 or 2 cells away from absolute max, so it's likely that with some players the Thief engine may be a bit twitchy, but trust me it was 1000% times better than in the first couple of beta's. Last edited by fortuni; 2nd Dec 2018 at 12:14. Well now I have the Chalice Of Life. But I cannot navigate the Room Of Statues. I've used the key on the lock outside the room and pressed the button. I've also read the plaque at the door, it hasn't helped! OK I figured it out through trial and error. Last edited by Marbrien; 2nd Dec 2018 at 12:28. While I've now played this FM through to the finish, there are two points left for me that I'm curious about. # I haven't found a single secret in this FM. Any hints or suggestions? # The warehouse manager mentioned that the Mages locked a storage room, banned everyone from entering and took the key with them. Coincidentally there's still a locked door in the warehouse that I can't get into. Any ideas on where to get this key? Having the same problem, can't navigate the Room of Statues (being pushed back to the start with a sound of flash bombs) despite I used the key and pressed the button. What's the solution there? 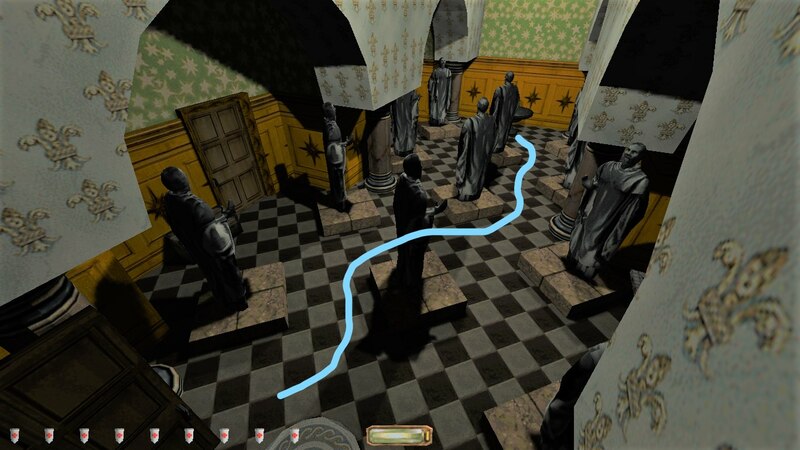 Big Hint: Remember the room of statues in Bonehoard level? How did you navigate through it? Spoiler: You must avoid the gaze of statues. You are pushed back to the start when they see you. For a secret, figure out how reach the chests in the room of statues. I also found another secret in the warehouse, search upstairs and remember to look up. Last edited by Aemanyl; 2nd Dec 2018 at 19:37.